Make sure you have sufficient rights on the SharePoint database. E.g. farm account. Also check to see if there is enough space left on the hard disk to store the backup. Since the update of the SharePoint TemplateSettings and Content Management for Anywhere365, based on SharePoint server or SharePoint Office 365 can take a while (up to many hours), it can be very useful to start the update within Business Hours and so minimize the downtime. The scenario below requires a ‘Change Stop’ for UCCUCC stands for Unified Contact Center and consists of a queue that can be handled by Agents Each Contact Center has its own settings, interactive voice response questions and Agent with specific skills. Agents can be member of, or sign up to, one or more Contact Centers. configurations. 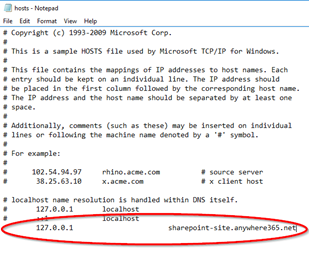 By modifying the Hosts file (or stopping the SharePoint IIS Site) you make sure the UCC cannot contact the SharePoint configuration pages and therefore runs with the current configuration set. This scenario can only be used if the SharePoint server is a different server than the UCC server. A back-up is now created and placed in the given location. Open SharePoint 2010 / 2013 Management Shell as “Administrator”. This scenario can be used when you are comfortable with SharePoint Central Administration and SQL. The scenario consists of 2 parts, where part 1 can be done during business hours of the UCC. Part 2 needs to be taken care of when the UCC service is stopped. Break the connection between the UCC service and the SharePoint server. Create a new SharePoint site collection and attach a new SharePoint Content database. Choose between Install, Uninstall, Activate or Deactivate. Choose if you want the script to show a list of available site collections or that you want to manually enter the URL of the site collection. When there are multiple site collections available the install script will show a list of the (numbered)site collections. Select the number of the site collection where the Template needs to be deployed. The template will be installed. If the installation is finished, a list with UCC setting sites within the selected site collection will be displayed followed by version number. If you have selected multiple site collections you see multiple lists. If there are no UCC settings sites (yet) you get the message: WARNING: No UCC Setting sites found in this site collection. If you have not enough permissions on the site collection to execute the version check you get the message: No UCC Setting sites can be accessed in this site collection. You must be a Site Collection Administrator. Recreate all UCC configuration sites via the Anyhere365 CopySettings script. In the case something goes wrong, trouble shoot first to find the issue. This is usually faster then the rollback. "Attach" the old SharePoint contact database by adding it using Central Admin.